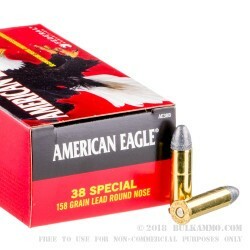 One of the cleaner all lead .38 Special range rounds you can find, the American made American Eagle 158 grain lead round nose cartridge is a great plinking round and very good in indoor ranges given the messy, smoky alternatives. The pricing on the American Eagle target rounds is very hard to beat, and while these are purpose built for paper targets they do give you the whole .38 Special experience. They aren’t the tame range loads you’re used to, but they aren’t a heavy duty defensive round either – just good old fashioned fun to shoot, cheap ammo for your day at the range. The 158 grain is a solid choice for moderate to mild recoil, and the cases allow you to handload later if you want to after collecting the Boxer primed brass. It just adds an extra bit of value to an already well balanced cartridge that’s sells almost as cheap as the cheapest imports. If you need “all day” ammo prices but want “every time” reliability, American Eagle is the choice with this lead round nose 158 grain load. Cheap, reliable, simple, and nothing to hide. 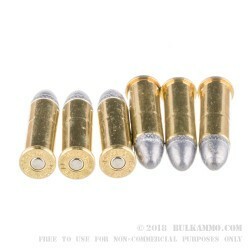 Q: Can you use this ammo in a 357 caliber ruger revolver. I have heard that 38 special and 357 ammo is interchangeable. Is this true??? A: Yes, you can safely fire these in your .357 magnum revolver. In fact many do so since the .38 isn't as powerful and is more comfortable to shoot, not to mention less expensive. You will want to make sure you thoroughly clean your cylinder each time out so that the debris doesn't build up. The .38 special is about 1/16th of an inch shorter than the magnum and debris can easily build up in that 1/16th of an inch over time. This will prevent full length magnum rounds from fitting all the way in the chamber. Q: How bad is the lead fouling on these rounds? I am looking at using them in a training workshop and I am worried about the fouling problem. A: Well, they're unjacketed lead bullets, so you'll see more lead in the bore than with jacketed or plated bullets. But this isn't really a "problem" until you decide to clean the bore. A: In most cases, we ship the same day as the order, or the next business day. 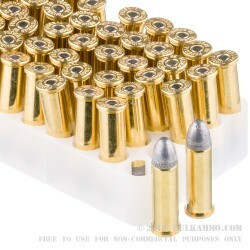 Only ammo that is in stock is shown on our website. Q: Hello, I was wondering if you had access to Federal Ny-Clad 125gr HP ammo? I've heard this is great for self-defense, but can only find single boxes at my local store. Thanks. A: Federal Ny-Clad ammunition generally suffers from inferior penetration when compared to modern expanding projectile designs. Hornady's Critical Defense .38 Special ammunition would be a better choice for defensive purposes.